In a hidden lake far below the Antarctic ice, scientists found the bodies of tiny creatures. Photos reveal how they accomplished the deep dive. An aerial view of SALSA scientists retrieving the corer on January 7, 2019. Scientists recently drilled 3,500 feet deep into the Antarctic ice to the subglacial Lake Mercer -a lake that had been untouched for thousands of years. They pulled up samples of water, ice, and lake mud from the depths for further study. 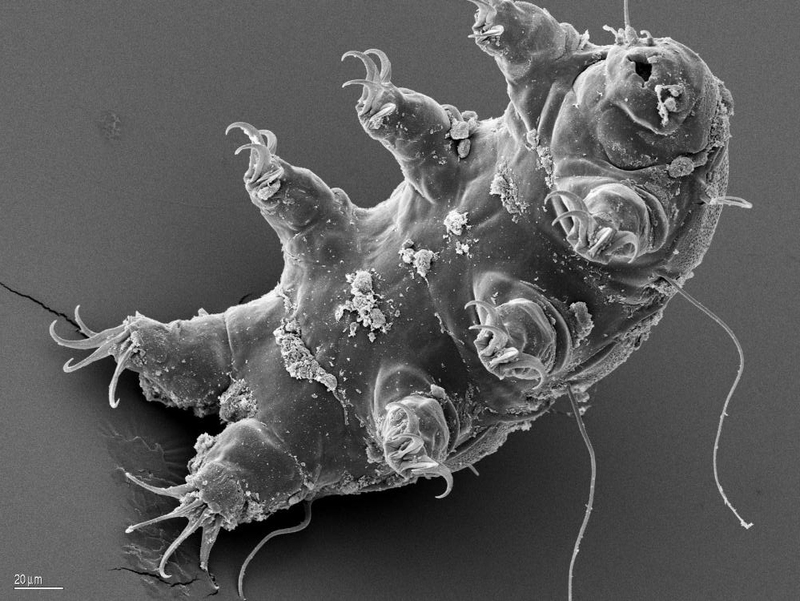 When analyzing the mud, researchers found the carcasses of tiny crustaceans and a tardigrade. The research team has shared additional images and video from their foray into the icy depths. Take a look. Scientists know more about the surface of Mars than they do about the environment under Antarctica’s ice sheet. But in December, a group of scientists drilled an extremely deep hole that is revealing secrets from that frozen world. Using a hot-water drill, a roughly 40-person team from the Subglacial Antarctic Lakes Scientific Access (SALSA) project bored a hole more than a kilometer (3,556 feet) into the ice. The goal: to explore an isolated subglacial lake below, called Lake Mercer. The team succeeded in reaching the lake, and extracted a 5.5-foot-long ice core (the longest ever from a subglacial lake), sediment cores, and water samples. The SALSA scientists expected to find microbes in those samples – similar microbial lifeforms had been dredged up from nearby subglacial Lake Whillans five years earlier. But the samples also turned out to contain the carcasses of higher lifeforms. The discovery suggests that these creatures were transported to Lake Mercer from nearby mountains (where such creatures have been found before) by moving water or an advancing glacier, Nature reported. “We’re going to change the way we look at Antarctica because of this research,” John Priscu, chief scientist of the SALSA project, told Business Insider. The SALSA team has since released images and video footage showing how they were able to bore a hole 3,556 feet deep in the ice. Take a look. Priscu said he’s been studying Antarctic lakes for 35 years. SALSA chief scientist John Priscu takes notes from the equipment launch and recovery deck. His team’s collected data about the salinity, temperature, and depth of the previously unexplored subglacial Lake Mercer. Priscu and the SALSA team were deployed out of McMurdo Station, a US Antarctic research center, for this project. The average annual temperature at McMurdo Station is 0 degrees Fahrenheit (minus 18 Celsius). But in order to reach the actual borehole site, the team had to travel hundreds of miles northward towards the center of the continent using specialized tractors and aircraft with skis under the wheels. After the deep hole was drilled into the ice, the team used a gravity corer — essentially a tube that gets screwed into the ice — from the Woods Hole Oceanographic Institute to pull samples of ice and mud back to the surface. The corer returns sediment from the deep. Even though the hole in the ice was no more than 60 centimeters wide, the researchers were able to slide the corer down the nearly 1-kilometer-long chute. After it hit the sediment below, the corer, and the mud it grabbed, were pulled back to the surface. One of the tools used by the SALSA team is called the multicorer, because it can bring up three sediment cores at a time. SALSA team members prepare the multi-corer to deploy down the borehole. In the case of Lake Mercer, the team sent down two multicorers back to back, which each retrieved three perfect sediment cores of lake mud. To capture never-before-seen footage of the lake, the SALSA team used a torpedo-shaped robot called SCINI (Submersible Capable of Under Ice Navigation and Imaging). The SCINI robot gets ready to slither down into the borehole. Most of the images and video of Lake Mercer would not have been possible without the SCINI robot, a remote-operated vehicle (ROV) designed for this mission. SCINI is operated with a specially programmed PlayStation controller. SCINI is 7 feet long and 10 inches in diameter to allow it to fit down the hole. It has three cameras and three bright lights – “kind of important when you’re traveling to a place that hasn’t had light in 50,000 years,” Zook said. “It felt a little bit like we were launching a spacecraft,” Zook said. The SCINI ROV, which weighs roughly 99 pounds, gets lowered down the hole. Zook said SCINI’s success in capturing the first-ever footage of the subglacial lake was three years in the making. The following images are blow-by-blows of the journey down, taken from SCINI’s footage. Looking down the hole from the icy surface, the first 300 feet or so is all air. A view of the top of the borehole. That 300-foot gap of air is called the freeboard – the term for the distance from the surface of the ice shelf to the water level. In this case, the freeboard is about as tall as the Statue of Liberty. “You don’t want to fall in that hole,” Priscu said. The borehole was about 18 inches in diameter, Zook said. The icy walls of the borehole squeeze SCINI on the way down. The hole’s small diameter meant that all of the tools, and all of the samples they brought up to the surface, had to fit through an opening just a bit bigger than a steering wheel. Before anything went down the borehole, it had to be sterilized to ensure no foreign contaminants would sully the hole or the subglacial lake below. The collar zaps any contaminants with heavy-duty ultraviolet light. Everything that went down, from scientific equipment to the boiling-hot water used to bore the hole, had to be sterilized. The SALSA team used a combination of hydrogen peroxide and ultraviolet light to ensure everything was clean and sterilized. A collar at the top of the borehole bathed tools, ropes, and the SCINI robot in UV light. The collar’s UV light was so powerful, in fact, that all the SALSA team members had to wear protective goggles. “Whenever it was on, a red light would flash on deck,” Priscu said. After a 100-meter (328-foot) journey downward, SCINI finally hit water. The camera approaches the top of the water layer. Think of the journey down to Lake Mercer like a layer cake. The cake frosting is the unpacked snow that sits on top of the ice sheet. The top layer is the 100-meter-long freeboard of air, followed by almost a kilometer of water, which is separated from the 15-meter-deep subglacial lake by a layer of ice. More than 900 meters (2,700 feet) of water separate Lake Mercer from the 100-meter-long stretch of air above. The camera is fully submerged under water as it glides deeper down the borehole. That’s 100 times the atmospheric pressure at sea level. Basal ice is often labeled “dirty” because it’s pockmarked with frozen sediment. Though basal ice can look like water with particles floating in it, the little pieces are actually sediment that’s been stirred up from the lake below and tiny pockets of air that sit suspended in the ice. This is the boundary between the basal ice and the subglacial lake. “On the right is the bottom of that dirty basal ice layer, and to the left is the liquid water of the lake,” Priscu said. Finally, the camera captures where the basal ice transitions into the lake. Finally, the camera hit rock bottom — literally. SCINI captures footage of sediment and pebbles at the bottom of the lake. What’s interesting about the freshwater subglacial lake, Priscu said, is that the temperature was measured at minus 65 degrees Celsius (minus 85 degrees Fahrenheit), but the water is still liquid. He said this is possible because the water in Lake Mercer is under enormous pressure. If you put water or ice under enough pressure, that lowers its freezing point. Samples of the lake mud revealed some astonishing finds. There were not only live microbes, but also the bodies of dead crustaceans and a tardigrade. “It’s the first time anything like that’s been seen,” Priscu said. SALSA team member Alex Michaud filtering water from a sediment core. The team won’t yet release any images of the dead critters. “We need to do more work before we release things that we’re not 100% about,” Priscu said. A microscopic image of a tardigrade, one of the most resilient organisms on the planet. Priscu said he doesn’t want to circulate images of the carcasses yet because it could compromise the team’s eventual publications on their finding. Priscu is hoping to eventually find more carcasses to solidify the team’s findings. SALSA team members David Harwood and Tim Campbell take mud samples from the drill head. “If we brought only one organism back from Mars, I don’t think I’d believe it,” he said. But that work will have to wait until next year. He added that the SALSA team’s funding runs out this summer, but he plans to request additional funding to keep the team together so they can process samples and document their findings. You can watch the full video of SCINI’s journey down the the 3,556-foot borehole below.